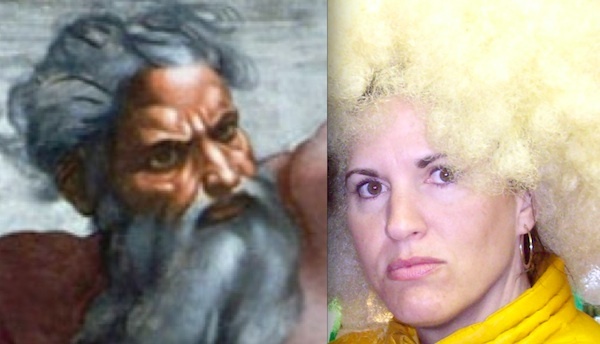 Photo ©Copyright/Courtesty of It was hard finding God to pose with me for this picture but we worked it out. My last blog, “My Slippery Slide Into Atheism,” was actually sort of a tribute to my respected, beloved, “unbelieving” friend, Jeremy Witteveen. I knew that, as the one who predicted my eventual cave into atheism, he would enjoy the alluring title and candid admission. You can find his thoughtful response to my blog here. If I remember correctly, Jeremy grew up in an evangelical Christian home and was very active in church and ministry. But ultimately, the usual (and imo valid) objections he had toward Christianity and the god portrayed therein, led him to completely different conclusions than the ones he was raised with. I am patiently working through many of the same objections myself, so friends like Jeremy are very important to me in my quest for an authentic faith in a worthy God. They challenge me in my blind spots and hold me accountable to reason, two crucial objectives. The God I’m discovering so far is quite different than the one Jeremy and I both grew up with, which was kind of like being raised on chocolate cake laced with rat poison—looks delicious and even sustainable from the outside, but try eating it for a few years…or a lifetime…and see how you feel. For some reason, people aren’t all that accepting of people who think that the big, invisible god described in the bible doesn’t exist. It’s weird. No one on earth can show him to me in tangible or reasoned terms, and I’m the idiot. I wish I had time to address the lack of acceptance our unbelieving friends feel around us. Shame on us. From my understanding of the Greek (no thanks to translators and publishers), the “unbelievers” addressed in the Bible are NOT people who don’t believe in God anyway. They are people who DO believe in God but who don’t act like it (i.e. Israel denied access to the Promised Land for unbelief even though they had witnessed encounters with God on many occasions). A better word might have been “disbelief.” This twist has bred a whole terrible and unjust prejudice, dislike, fear, and even hatred against “the world” that should have never been there. Because of it, we have really missed out on some great people from inside our little insulated bubble. Belief in God for anyone is an inner revelation that only He can accomplish. Why in the hell would we penalize many beautiful, gifted, passionate, caring, generous, radically accepting people—people who act more like God than many Christians—for something that they have no control over or real choice about? You cannot (and should not) believe in something you have never witnessed yourself, plain and simple. To this day, I am proud to say that I don’t believe in Big Foot, the Boogie Monster, or the Flying Spaghetti Monster. But that discussion is for another time. I want to address Jeremy’s last thought. “No one on earth can show [God] to me in tangible or reasoned terms.” A lot of atheists or agnostics get stuck on the lack of hard, cold evidence for the unseen God. Is reasonable or tangible evidence of God to be found? Lots of people look at Julie Ferwerda, but do they actually see “me,” or do they merely look at the residence where I am currently housed? My skin, my hair, my eyes, my body…none of that is me. No one can see or define the real me. When I die, my body is still here, decomposing, but I am no longer in that visible house. The essence of me—that which actually makes me who I am—is unseen. The expression of me, by which I operate on earth and interact with others tangibly, is comprised of my cells, body systems, chemicals and hormones, organs, and outer features. I can hide myself from certain people by being silent, by closing off part of myself from them that I don’t want them to see, or even by avoiding them. If the essence of us is unseen, why would we object to the same regarding God? Ancient perspectives on God reveal that we are each aspects of God, expressing Him in a visual, tangible form on earth, and perhaps in the intangible sense by our essence. Our individual selves are portrayed as sparks out of a Fire, imbued with passion, creativity, and light. In other words, we are the housing place of God—His body cells if you will—giving Him expression and form on earth. It’s not hard to imagine or envision this. People, especially child prodigies, constantly amaze me with their amazing gifts, talents, passions, and creativity. I once devoted a blog to this, featuring just a small few who, to me, reveal the spark of Divine. I feature a girl who was born a world class artist, a man with autism that can draw a major city to scale after viewing it from the air for fifteen minutes, a man who produces intricate sculptures out of grains of rice, and others. And I believe that our current creativity and passionate expression is just a microscopic, practically invisible version of what we are all becoming. I think it will be like comparing a candle flame to the sun! After reading Jeremy’s blog, I visualized this unseen God with a way to express Himself in a “visible body” made up of these cells of individuals. Every cell of a body serves a unique and necessary purpose to the whole before it finishes its purpose, dies, and then is replaced by a newly generated cell. Healthy cells do a stellar job of working together to benefit the whole, while unhealthy or mutated cells become a detriment to the rest, perhaps even lethal. A cell need not know of its own essence—the one being housed within its borders—in order to carry out its function. Science has come to realize that each cell is a little complex universe of its own, with different cells programmed during their maturing phase to serve a specific and unique purpose. Today, I see God expressed in people, as well as in nature and all life. Everything in my world amazes me with its unique wonder, complexity, magic, purpose, and enormous value. Jeremy may suggest that my path is a “slide toward atheism,” but I digress. As I patiently ask and sift silently through the rubbish pile of history, and at the same time seek Divine presence and inner Light, I still find God. Yes He is different than I thought (yay! ), and I still have many unanswered questions, but each one that answered so far has brought me to a deeper love for God. For now, I’m making peace with the questions and the not knowing until I come into greater understanding. Are You Following The Pilot Car?